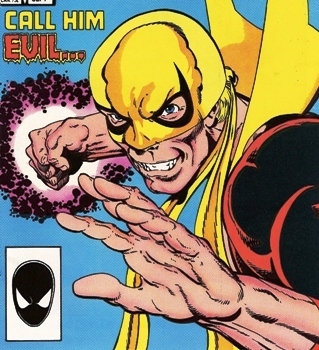 Powers/Abilities: "Iron Fist" was a well-trained martial artist granted the power, or a facsimile of the power, of summoning his life force into his fist and using the 'iron fist' power repeatedly. History: (Power Man I#119/Namor I#23 (fb)) - When the mortal Daniel Rand, Iron Fist, returned to K'un-Lun for healing from his deadly radiation poisoning, he was taught how to turn his power inward to try and heal himself. Why he did so, he was kidnapped by the H'ylthri, native plant people to the K'un-Lun dimension, and replaced by a plant-automation they created. The automation was given copies of Iron Fist's memories, personality traits, and fighting ability, and was sent to impersonate Rand while Rand himself was used as food and fodder for the H'ylthri young, placed in a feeding tube. "Iron Fist" arrived just in time to aid his friends Power Man (Luke Cage) and the Thunderer against the dragon, Chiantang. (Power Man and Iron Fist I#120) - "Iron Fist" battled the dragon and surprised his friends as he was using the 'iron fist' power repeatedly, something the true Iron Fist could only due sporadically, and because his costume turned red as he began to fight. The Thunderer explained that the red coloring was a reflection of the guilt that Iron Fist recently felt, which the automation also inherited. Without speaking, "Iron Fist" held off the dragon until his allies aided him in driving Chiantang to another dimension. (Power Man and Iron Fist I#121) - Returned to Earth by the all-powerful Beyonder, "Iron Fist" and Power Man found their headquarters gone. The Falcon (Sam Wilson) came and asked them for help in finding Captain Hero, a young boy with the power to become a strong hero who also happened to be dying. Before they could leave, the Beyonder arrived and showed them his ocean headquarters, telling the heroes of his plans to change the Earth, a plan "Iron Fist" agreed with. "Iron Fist" and the Falcon approached Nick Fury of S.H.I.E.L.D. and discovered the government's plan to destroy the Beyonder's headquarters. They accompanied S.H.I.E.L.D. to the hq before "Iron Fist" opposed the agents as he wanted the Beyonder's plan to go forward. An over-eager agent fired missiles at the hq and, though Captain Hero flew by and stopped two of them, "Iron Fist" had to deflect the last missile himself and would have been killed had the Beyonder not saved him. "Iron Fist" looked in on Captain Hero in the hospital, then tried to call Misty Knight, the real Iron Fist's girlfriend. "Iron Fist" received a visit from Maxine Walters, Heroes for Hire's current employer as head of Consolidated Conglomerates, Inc., who had a crush on Iron Fist. (Power Man and Iron Fist I#122) - Maxine quickly grew frustrated with "Iron Fist's" lack of interest in her, but he was struggling with his deep guilt. Misty, who was now involved with the mysterious Tyrone King, visited just before Chiantang, who was now on Earth, attacked and subdued Misty and "Iron Fist," who was still suffering from the radiation poisoning. "Iron Fist" was kept captive wit Power Man on a boat until Misty helped them escape. An explosion nearly killed "Iron Fist" until Misty resuscitated him. "Iron Fist" and Misty bid each other farewell. (Secret Wars II#9) - "Iron Fist" and Power Man participated in the final assault on the Beyonder beside many of Earth's heroes. (Power Man and Iron Fist I#124) - "Iron Fist," wearing red uniforms as he didn't feel worthy of the green ones, accompanied Maxine to an Asian country where they responded to a letter "Iron Fist" received stating it could aid him. "Iron Fist" entered a complicated battle against ninjas and gunmen to get to the letter writer, who helped "Iron Fist" come to terms with his guilt. "Iron Fist" was not aware that this was Gordy, an ally of Heroes for Hire, who'd agreed to aid Power Man and Maxine in helping "Iron Fist" "Iron Fist" felt as though he had a new lese on life. (Power Man and Iron Fist I#125) - After "Iron Fist" and Power Man played in a charity baseball game, they were attacked by an old foe of theirs, the armored John Lumus. 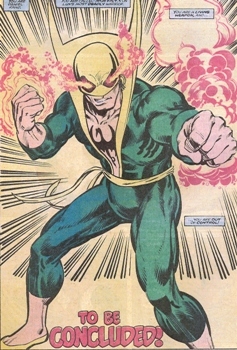 After using his iron fist power in the battle, "Iron Fist" turned red again and soon learned that his experience in finding self-healing had been a set-up. Power Man informed Maxine, Jeryn Hogarth (the H4H lawyer), and "Iron Fist" that he was quitting the company. Receiving news that Captain Hero was dying, "Iron Fist" rushed to the hospital and used his powers to keep the boy alive for as long as possible while their allies in the Avengers and the Fantastic Four sought a cure for him. After several hours, "Iron Fist" believed Captain Hero's illness had subsided, and fell asleep. When Captain Hero awakened, however, he felt even sicker and lashed out in a rage that killed "Iron Fist." (Namor I#21) - Dr. Strange investigated "Iron Fist's" remains. (Namor I#25 (fb)) - It was later revealed that Master Khan was secretly Tyrone King, in disguise, and that he manipulated the shape-shifting Super-Skrull into posing as Captain Hero in a revenge scheme on Iron Fist. Khan later learned that it had been the H'ylthri automation killed, and attempted revenge on Iron Fist again. Comments: Created by Jim Owsley, Mark Bright, and Jerry Acerno; retconned into automotan by John Byrne.